A virtual network IP address is assigned to every Pod, which could consist of one or more containers. Pods can connect to peered virtual networks and to on-premises over ExpressRoute or a site-to-site VPN. Pods are also reachable from peered and on-premises networks. 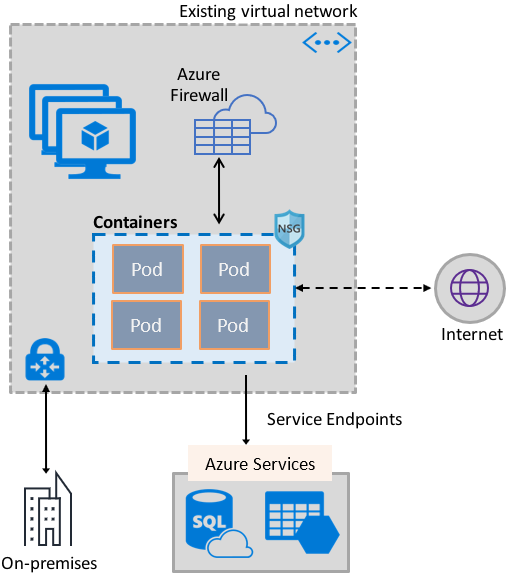 Pods can access services such as Azure Storage and Azure SQL Database, that are protected by virtual network service endpoints. Network security groups and routes can be applied directly to Pods. Pods can be assigned a public IP address, which makes them directly accessible from the internet. Pods can also access the internet themselves. Works seamlessly with Kubernetes resources such as Services, Ingress controllers, and Kube DNS. A Kubernetes Service can also be exposed internally or externally through the Azure Load Balancer. The plug-in supports both Linux and Windows platforms. To enable Pods to access the internet, the plug-in configures iptables rules to network address translate (NAT) the internet bound traffic from Pods. The source IP address of the packet is translated to the primary IP address on the virtual machine's network interface. Windows virtual machines automatically source NAT (SNAT) traffic destined to IP addresses outside the subnet the virtual machine is in. Typically, all traffic destined to an IP address outside of the IP range of the virtual network is translated. The plug-in supports up to 250 Pods per virtual machine and up to 16,000 Pods in a virtual network. These limits are different for the Azure Kubernetes Service. Azure Kubernetes Service: The plug-in is integrated into the Azure Kubernetes Service (AKS), and can be used by choosing the Advanced Networking option. Advanced Networking lets you deploy a Kubernetes cluster in an existing, or a new, virtual network. To learn more about Advanced Networking and the steps to set it up, see Network configuration in AKS. AKS-Engine: AKS-Engine is a tool that generates an Azure Resource Manager template for the deployment of a Kubernetes cluster in Azure. For detailed instructions, see Deploy the plug-in for AKS-Engine Kubernetes clusters. Creating your own Kubernetes cluster in Azure: The plug-in can be used to provide basic networking for Pods in Kubernetes clusters that you deploy yourself, without relying on AKS, or tools like the AKS-Engine. In this case, the plug-in is installed and enabled on every virtual machine in a cluster. For detailed instructions, see Deploy the plug-in for a Kubernetes cluster that you deploy yourself. 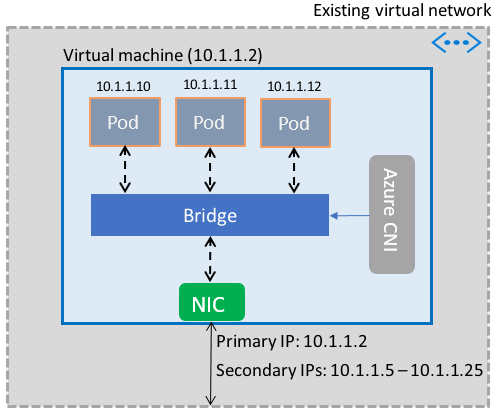 Virtual network attach for Docker containers in Azure: The plug-in can be used in cases where you don’t want to create a Kubernetes cluster, and would like to create Docker containers with virtual network attach, in virtual machines. For detailed instructions, see Deploy the plug-in for Docker.